A traditional food tradition on “Oudejaarsavond” or New Year’s Eve is to munch on a pastry aka Dutch doughnut. A typical Dutch old fashioned golden-fried dough spheres plain or filled with currants, raisins called “Oliebol or Oliebollen plural form. In character sold at food stalls called “Oliebollenkraam”, bakeries or special food trucks with other delicacies e.g. apple fritters named “Appelbeignets” next to “Berlinerbollen”, again fried dough, flat oval shaped and filled with a fruit jam or custard and much more. In reality, the fried doughnut could vary enormously in taste, flavour and presentation. At times a far cry to be named a perfect oliebol but being literally an unworthy blob of gunk, the double meaning of oliebol translates as a greaseball. Hence, the jokingly rib often cried in exasperation of a person being an ignoramus “oliebol”. Oliebol as a favourite traditional pastry snack mostly munched in the weeks heading towards the countdown or occasionally at carnival fairs throughout the rest of the year. We like nothing more than a perfect oliebol being crispy, moist and flavoursome. With intervals, the oliebol quality varied greatly which inevitably led to a popular yearly nationwide contest to find the best oliebol. 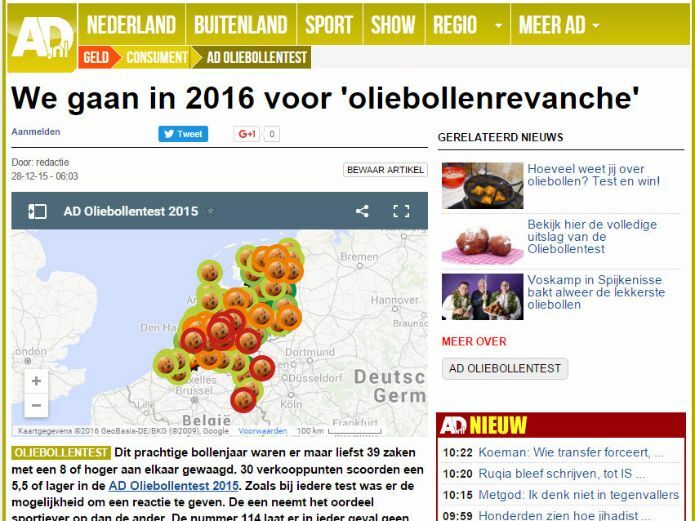 The popular 23rd edition of the Oliebollentest 2015 held by Dutch newspaper Algemeen Dagblad (AD). This year 164 contestants from various cities across the country were listed, reviewed and published in Uitslag AD Oliebollentest. More than 39 vendors scored an 8 or higher, click on the list to view whether the top 25 vendors are near you to satisfy your olliebollen appetite. Those who didn’t make the cut have vouched for revanche in the upcoming test for the title or top listing, which invites for another round of tasting 2016. More than 39 vendors scored an 8 or higher, click on the list to view whether the top 25 vendors are near you to satisfy your olliebollen appetite. Those who didn’t make the cut have vouched for revanche in the upcoming test for the title or top listing, which invites for another round of tasting 2016. Yesterday we joined family and friend celebrations at two different homes while devouring very tasty Oliebollen, also the first bites of this winter season. Unbeknownst to us, the delicacies were from vendors listed in the top five places. Their origin was revealed as #2 Bakkerij Olink, Maarssen and #6 Bakkerij Vliegendehond, Wolvega. Truth to be told the “oliebollen” were fantastic, beautiful golden colour, crispy on the outside with a nice airy crumb bit moist without being soggy nor greasy. Fruity aroma flavour of currants and raisins without being overly sweet, often they are sprinkled with icing sugar on top. 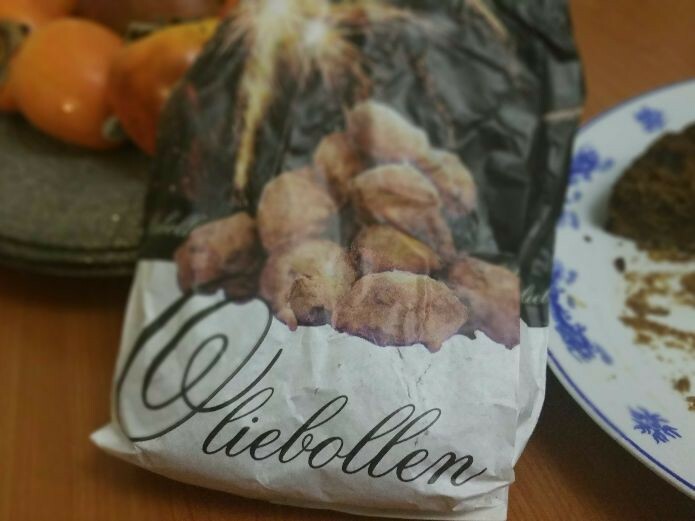 For Dutch food lovers and language learners in search of authentic food, you can find an English recipe version by clicking this link olliebollen en appelflappen. 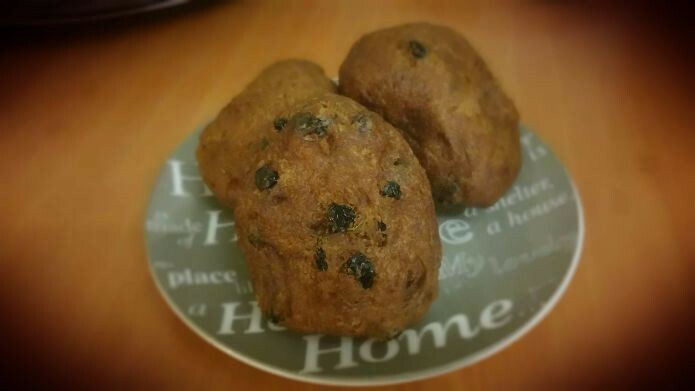 I just stumbled upon one of my culinary forums on an old thread regarding oliebollen, a highly recommended recipe post “Bollen bakken” on Eetschrijven blog by Gerrit Jan Groothedde, Dutch culinary journalist. A recipe translation will be added here shortly. The blog post with recipe starts with a friendly but adamant request after baking the delicious Oliebollen, to keep them warm or reheat by setting the oven on 100°C/212F for 15-20 min. to keep the delicacies warm and crisp. I have to concur with his advice, if possible, to avoid the microwave this will only disintegrate flavour and taste of the oliebollen. Also not to pair fine glass Champagne but perhaps a better fit would be beer instead if alcohol is a must. Eaten as a snack, lunch or whenever you fancy with a nice cup of tea or coffee makes it perfect too. Eet Smakelijk en Gelukkig Nieuwjaar – Enjoy and a Happy Newyear!